Christmas came in February this year. Back in December, I picked out a couple of marble cutting boards as a gift from my parents. They ended up backordered and I got them two months post-holiday. Honestly, what is more fun than a surprise gift that you’ve almost forgotten about? I don’t actually need cutting boards but I was taken by the design of these. The cutting boards were on clearance at Wisteria. I love that catalog. They have the neatest things and they always have good sales. Those boards are very heavy and are even better quality than I could have imagined. I wasn’t sure what I was going to do with them but I knew they had called my name. I propped them here and there but never found the right spot. Also, I didn’t want them falling over on anyone’s fingers. A couple of weeks ago I decided to hang them and I’m sold. I used gorilla hangers but eventually I might buy some fun little hooks to hang them from. I’m such a believer in things coming together over time. Maybe if I wait long enough this kitchen will be just what I envision. I’m pretty happy with it now though. It is amazing what a difference a few small changes can make! I knew from the time I bought our kitchen fixture that I wanted to paint it. That seems a little crazy with a brand new light so I let it be for a while. And then the New Year enthusiasm got to me, and as soon as normal post-holiday life returned I got out the paint brush. I wanted to use a Modern Masters paint but not the shiny gold I’d used on previous projects. I bought a nice coppery bronze from my local paint store. I got the small size (about $14) to save money. That stuff goes a long way! I took off the shades which was easy enough — I just had to untwist the collar. I didn’t even use tape for this project- the shade had the perfect lip that created a stopping point for the brush. It took several coats but they went on easily. I never worried about the finished product because I’ve used the paint enough to know how well it coats. Isn’t it lovely? I’m really digging it. Funny, I’m not a huge fan of the fruit in our backsplash but it does seem to complement it nicely. I got some glittery gold pinecones after Christmas for dirt cheap and I swear they sparkle with the new addition. Also, the shades now look more oil rubbed bronze than black. There are some hints of copper that come out. You can see the edges aren’t perfect but we don’t worry about such things around here. In fact, I didn’t notice until looking at the picture. Before the roundup is complete, I need a good before & after. I’m not sure why the color is so washed out in the “before” but it helps the after look good! Can I just take a moment and pat myself on the back for already completing a project this month? I know it is small but this is encouraging, considering my lack of projects last year. Baby steps, right? Are you eager to work in the house this time of year? I’m definitely feeling motivated. The color is Modern Masters brass. The original fixture was purchased here. With Thanksgiving next week, it is only appropriate to check out the current state of the kitchen. Honestly, we travel for the holiday so mine will not be in service but we can pretend it relates. It is without a doubt the most used space in our home. This is the biggest kitchen I’ve ever had. Smaller house, bigger kitchen. It works for me! I am enjoying the dream kitchen and I might be spoiled now. Ridiculously spoiled. As previously mentioned, I’d like a new backsplash. And truth be told, the granite isn’t my favorite but I’m easily able to overlook those things in my light, bright mega kitchen. Fancy appliances, lots of drawer space, miles of island and I’m not going to complain. I’m still trying to insert more of a farmhouse vibe than the original french country look. The new light fixture helps for sure. 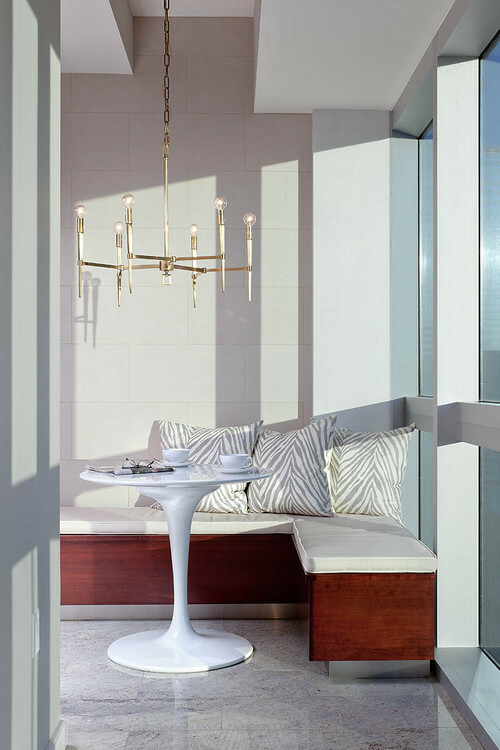 It is from Shades of Light and was a bargain compared to a typical fixture of that size. I’ve covered the large bronze fruit plaque with a framed fabric swatch for right now. That is not permanent but the fruit was mocking me so I had to smother it. This is pretty much how the kitchen looks all the time. Dog bowls, bananas, bread, and a toaster oven. Such things often don’t appear in staged kitchen pictures but I didn’t figure you would judge the essentials. Of course, missing from the picture is the stack of mail, school papers, crumbs, and dirty dishes. I did remove that for your viewing pleasure. 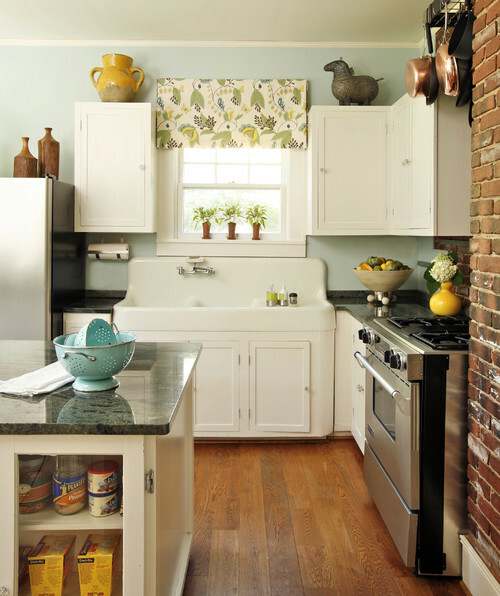 The only thing I miss from my old kitchen is the farmhouse sink. Maybe one day I will replace this one but right now that is not a priority. Are you cooking in your kitchen next week? After two years with a broken kitchen faucet we finally bit the bullet. Because it was only the sprayer that was out of use, it was never at the top of the list to get fixed. Also, if you remember, I waffled quite a bit on the style. Our old faucet was a beautiful copper with a Victorian feel that quite frankly was not affordable to replace. We ended up with a solid choice that looks even better than I imagined. The Kohler Cruette was my dad’s suggestion forever ago and it turned out to be just right. They had an oiled bronze option which was what we were looking for. I ordered it through Home Depot because their price was the most competitive. They carry the nickel version in the store but not the darker color. If you look closely, there is actually quite a bit of a coppery color that is rubbed into the bronze on this faucet. That was one reason I chose this one in particular. I didn’t want to get rid of the copper so I compromised. My in-laws are selling their vacation cottage and I had the opportunity to help transform the kitchen. They were advised by a realtor to update the space for selling purposes. Of course, budget was important because the goal is to sell. Who wants to sink lots of money into a house that is going on the market? I knew that the kitchen had major potential. 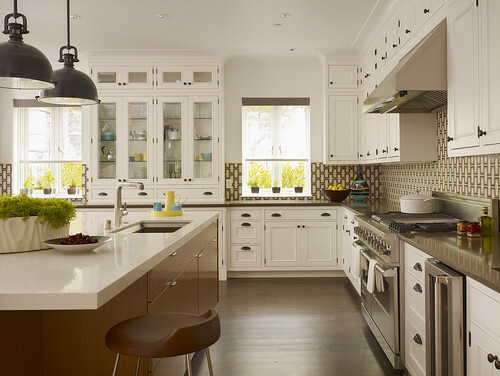 With painted white cabinets all it needed was new knobs, a backsplash, and granite countertops. Of course, you have to get a new sink and faucet when you go the granite route. When this picture was taken, a few of the knobs on top had already been replaced. I made suggestions for the granite but they did the fun part of going to the design center and specifically picking it out. I find giant slabs of granite intriguing. They are all so different – even within the same color scheme. We were going for a neutral with some white and tans. AND the price point was essential. There are still nice choices on the lower price tiers. I picked up the knobs at Home Depot. These Liberty knobs come in a ten pack which is helpful and once again – inexpensive. The backsplash is white subway tile. I actually got several samples but we ended up going with the basic white subway tile from Lowe’s. It is a great white – not TOO white because the cabinets are a shade off-white. Also, the counters have some beige tones. It is crazy how many versions of white subway tile I saw. It is amazing what a little updating will do. They did decide to stick with the older appliances and I don’t blame them. I’m sure the new owners will be happy to pick out something new if they would prefer. It would have been fun to do new lighting but it made sense to focus on the major stuff. I’m hoping to get over there and get a few more pictures of the details when I have a chance. I need some up-close shots of the granite and tile to really do it justice. I think they wished they had made these changes a few years ago so they could have enjoyed it. It is funny how something so intimidating can seem simple once it is all said and done. 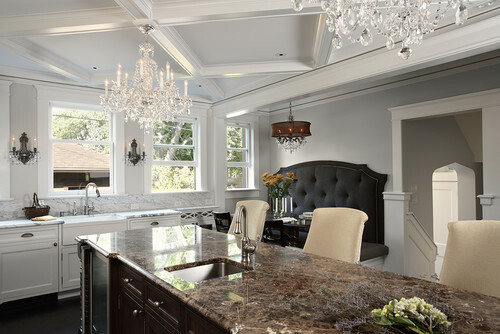 Do you decorate above your kitchen cabinets? That is the question of the day. I’m Switzerland when it comes to yay or nay. I love a clean look but my cabinets aren’t tall and a little something could do wonders it seems. I’m on the fence big-time on this one. I sneeze at the dust and frown at the too-tall lip the moulding creates. I stand on clean counters in dirty shoes hanging on for dear life trying to arrange so that it looks good from below. Just because it looks good standing on tiptoes with my nose 3 inches from the basket, does not mean it will look good at ground level. Problem solved. Can I have the tile too? And the lights? I like the simplicity of the larger items in this case. Maybe I’m just distracted by that sink. I like the idea of using mostly the same color like above. I do like white. The swans kind of scare me though. Vases are a good choice. Once again they are tied together by the same color. Ashley at The Handmade Home did a great job using colorful typography above her cabinets. I’ve always liked Lindsey’s globe collection from The Pleated Poppy. In honor of Halloween, I almost included a couple of scary pictures that I saw. Hello, huge collection of mallard ducks on top of the kitchen cabinets. I’d hate to hurt the feelings of the mallard duck man (it has to be a guy, right?) so I passed on the opportunity. And I’d hate for you to have to carry that image with you the rest of today so you can thank me later. Well, do you or don’t you decorate the space above? Do tell. The kitchen has evolved so much since we first bought our barstools. In fact, I think they were our first purchase in this home. I love my fancy pants pair from Ballard Designs; they create a nice transition from the family room to the kitchen. 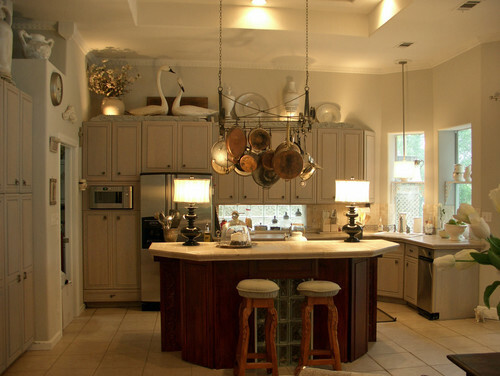 The less expensive, metal barstools fit nicely because they are in a walk- through area. I like that they actually slide under the bar. Originally, the lighter metal seemed like the way to go but after all of the recent changes, I knew they needed to go dark. The stools became more noticeable with each change. It no longer seemed like they were tied to anything. I knew I was going to spray paint them at the first possible opportunity. I just didn’t know I’d have to wait so long! Who knew that spring was going to take forever and a day to arrive? I thought I’d be able to do this weeks ago. We finally got a 70 degree day so I made the best of it. It was a little windy but I made it work. I am a big fan of the Rustoleum hammered spray paint. This was my first time using the black; I have used bronze more times than I can count. The black isn’t too dark which was my fear. The color came out even better than I imagined! I used one of their trigger spray bottles which is worth the extra $$. I did about three coats per stool total. I might have gotten away with two if it hadn’t been so windy. The minute they went back in the kitchen, I knew I’d made the right choice. Do you like the change? Got any big spray paint plans this spring? Earlier this week, I mentioned my partiality to the banquette. 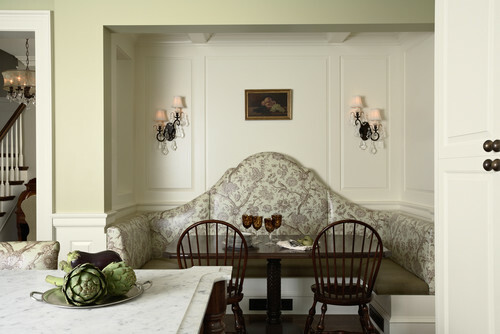 While I am limited to my cozy corner chair, I can’t help but swoon over these amazing banquette combinations. 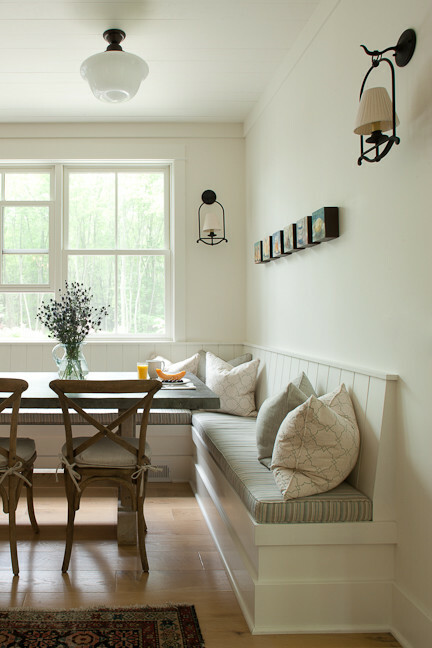 From corner built-ins to pieces of furniture, the banquette is big right now. There are many lay-outs to consider. I tend to think of banquettes as farmhouse style but this collection of pictures proves that it is very versatile. by Charlie & Co. Design, Ltd. So many banquettes, so little time! I’ll have to do a Part II to this post some day because there is so much inspiration out there. 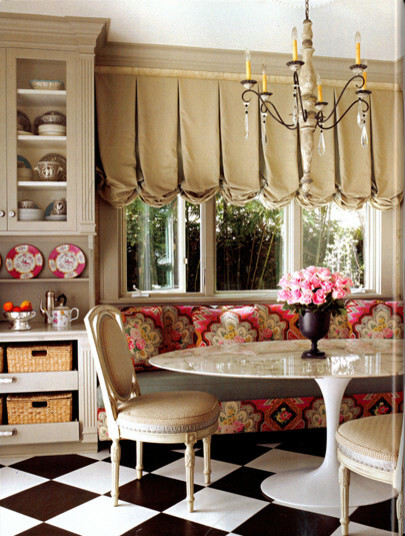 I like the corner banquettes but there are so many possible layouts. The built-ins are amazing but furniture is more interchangeable. Of course, some of these aren’t exactly little kid friendly. Do you have a favorite? 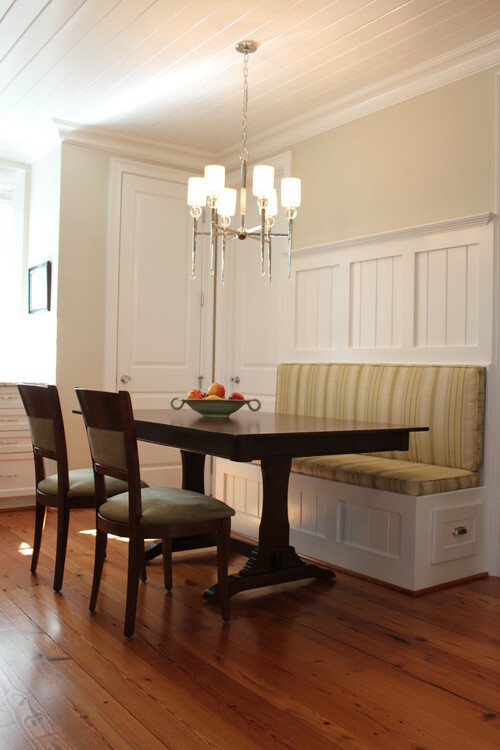 Or a banquette in your kitchen? I thought I’d show you a couple of updates to the breakfast room. Before Christmas, I finally got a seagrass rug. It is from Home Decorators and is just what I was looking for. It is rough on the feet but has already proven to be spill and stain -resistant. With small children, I can’t see any other option and so far this seems to be much better than the indoor-outdoor rug that we tossed during the move. I wouldn’t choose a rug that is quite so textured for the family room but I am pleased with the quality. Also, I took down the curtains for a cleaner look right now. I actually took them down to finally lengthen them but I found I was enjoying the fact that they were down. I’m not against putting them back up but that has fallen by the wayside for now. This chair has taken up residence in Reid’s room, the living room, and now the breakfast room. 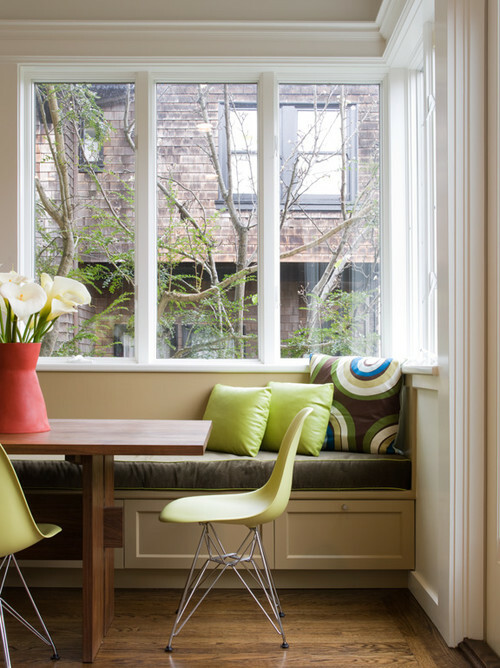 I love the banquette look but our windows don’t really allow for that so my corner chair will have to do. I’m finding it to be a cozy addition. I tried it there once before but it was before the dresser and rug so it seemed to stick out. Now it tucks right in. Oh, and I’m excited about a makeover on the horizon for that dresser! 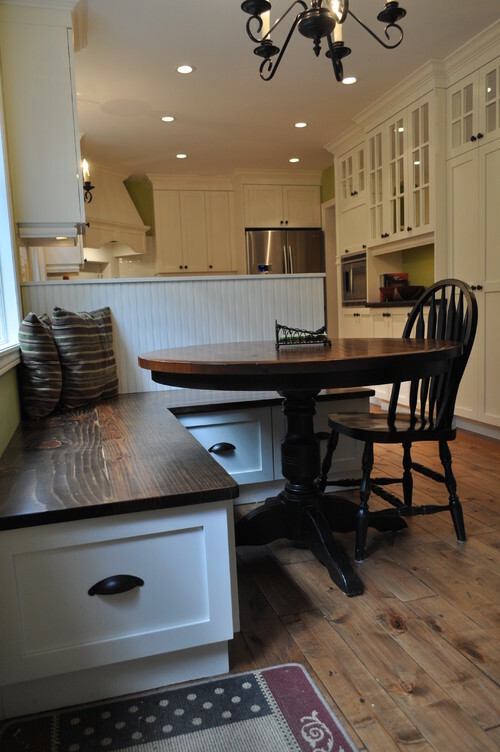 Do you have any “extra” seating in the kitchen or breakfast area that isn’t at the table?